The makeup and hair look this season at Jill Stuart was very natural and youthful, with a dark romantic inspiration. When Stuart was designing the collection, she pictured stylish English girls attending a dinner party in the countryside; who are those girls and what would they wear? The idea was to keep the collection poetic and young, yet elegant and modern. The same rang true for the hair and makeup, done by the talented stylists over at Kerastase and MAC Cosmetics. For the hair, the idea was to keep it very relaxed and natural, very undone. The hair was treated with Kerastase Fibre Architecte, a serum used to sculpt and style the hair and tame fly-aways pre-blow-dry. Then to create waves and texture in the hair, stylists used Kerastase Ciment Thermique before curling with a curling iron to give the hair volume with the waves. To finish it off, the hair was combed through the tousled to keep the hair looking natural and easy. For the face, the wonderful team at MAC Cosmetics made each model glow with fresh and relaxed makeup. The skin was dusted with MAC Pressed Powder to decrease any shine, and the sheer coverage allowed the skin to remain dewy and radiant. The lips were coated in a light layer of Lip Conditioner to play up the natural color of each model’s lips. The eyes were given a light layer of taupe eyeshadow along the lash line to give the eyes a little smokiness, and then topped off with a coat of brown mascara. The eyebrows were filled in slightly with a brow pencil to increase definition and shape. The overall look went perfectly with the fresh, young look that came down the runway. 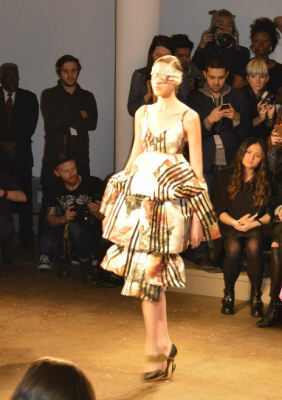 For designer Alexandre Herchcovitch, this season’s collection was more conceptualized and bold than Jill Stuart’s. The Brazilian designer surprised us when he cited flowers as the inspiration behind the collection, but the real surprise was his interpretation that went down the runway. The anatomy of the flower was peeled back in layers, from dresses revealing bustiers underneath to voluminous peplums resembling petals; overall the concept turned out to be intellectually thought out and executed. Hair and makeup for the look was equally as interesting as the garments. The hair was done by Bumble and Bumble, makeup done by Gordon Espinet at MAC Cosmetics. The hair was straightened using Bumble and Bumble Grooming Crème, and deeply and sharply parted on one side. One side was sleeked back close to the head and French braided beginning at the end of the part to the end of the hair. The other side was slicked back behind the ear the left down. The look was finished off with Bumble and Bumble Thickening Hairspray and BB Does it All Styling Spray. It was very controlled and shiny, yet completely right for the strong look of the collection. The face was done by makeup artist Gordon Espinet for MAC Cosmetics. The idea was to have a bold, colorful look that was still simple. The face was kept clean and evenly toned, as well as the lips. The eyes were where this look came to life. To brighten up the eyes, Espinet used MAC pigments in bright colors to line the eye; one line across the lash line on the top lid, and one outlining the crease of the eye, leaving the middle untouched. The look was subtle but strong, just like the designs walking down the runway.